4 April - 21 September. M. Senghor has created a pleasant site with a French feel and some surprising features for such a compact site. Notably these include an attractive heated leisure pool with water slides, whirlpool and a paddling pool, safely separated from the main pool and with its own little slide. There are 77 level pitches for touring, separated by hedges or shrubs and all with electricity connection adjacent (6A). Beyond these are 121 mobile homes and chalets (80 to rent). Although in an urban setting, the sandy beaches of the attractive Côte Eméraude are only a short drive away. 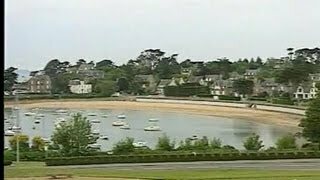 Saint Briac has a choice of shops, bars and restaurants and the resort of Dinard is only seven kilometres to the east. 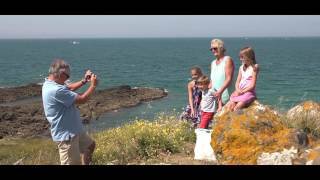 A bus service will take you there and you could then hop on the sea bus across to Saint Malo. Large heated toilet block with washbasins in cubicles and controllable showers. Facilities for disabled visitors. Baby room. Washing machine and dryer. Motorhome services. Shop and takeaway. Bar (July/Aug). Swimming pool (15/5-15/9). Games room. Excellent play area. Minigolf. Bicycle hire. Children’s activities and evening entertainment for families (July/Aug). Gas barbecues for hire. No twin-axle caravans or large motorhomes. Only dogs under 15 kg. accepted in rental accommodation. WiFi throughout (charged). St Briac is 7 km. 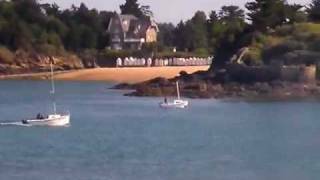 west of Dinard. From ferry terminal follow signs for Dinard. Turn west onto D168. Keep west onto D603 and follow signs for ‘Camping Eméraude par la côte’ (avoids town centre); site is well signed from there. From other directions take D976/N176 following signs for Dinard.